The latest raid by gunmen on a suburb of Baghdad has prompted fresh fears about the safety and vulnerability of the Iraqi capital. Until a few months ago, Baghdad was witnessing five or more bomb attacks every day. But a much calmer atmosphere has prevailed in the past month because of fewer attacks. Now, however, the blood spattered walls of the Zayounah apartment complex, in which at least 30 were killed on Saturday, is a stark reminder of the vulnerability of Indian diplomats, businessmen and workers, as well as other foreigners, who continue to live in Baghdad. One school of thought blames ISIS extremists and their supporters for the raid carried out by gunmen travelling in four-wheel drive vehicles. The vehicles they used in the week-end attack on the Zayounah suburb of eastern Baghdad are identical to the types of transport used by ISIS forces when they crossed the Syrian border before taking Mosul. Others say the raid was the handiwork of one of the many Shia militias who operate in Baghdad and seek to enforce their own brand of orthodoxy in the capital. Hence, the Arabic word for prostitutes that was painted on the outside walls of the doomed apartment complex. 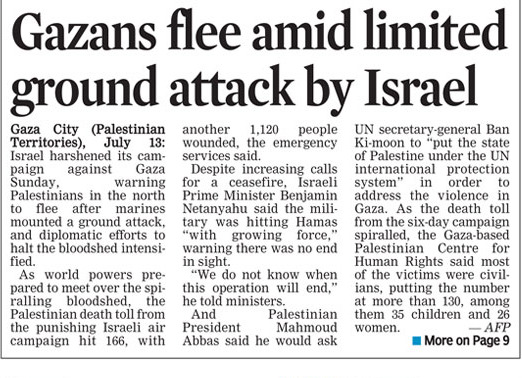 Either way the police and army units deployed in the area should have been sufficient to prevent the deadly raid. Analysts say the presence of four Iraqi army divisions deployed to guard the capital and their failure to prevent the Zayounah raid invokes comparisons with last month’s ISIS attack and conquest of Mosul in northern Iraq. Mosul was defended at the time by some 50,000 Iraqi soldiers who just melted away when the city was attacked and captured. The soldiers guarding Baghdad are supposed to be of a much higher calibre, yet they proved to be completely ineffective in Zayounah raid in which most of those killed were women. All hopes of defending Baghdad are now pinned on the visiting head of Iran’s Revolutionary Guards’ Quds Force, General Qassem Suleimani, who is credited with helping Syrian President Bashar Al Assad in his fight against anti- government forces. Finance Minister Arun Jaitley has allocated Rs 2,250 crore for the modernisation of India’s border infrastructure, besides allocating Rs 990 crore for the socio-economic development of the villages along the borders, in his Budget proposals. This will benefit the villages in Punjab, Jammu and Kashmir and Rajasthan. The border modernisation includes the proposal for strengthening infrastructure along the India-Pakistan border. The government has earmarked Rs 300 crore for the purpose, a sharp increase when compared to an outlay of only Rs 95 crore in the Budget 2013-14 for strengthening the infrastructure along the India-Pakistan border. The border management includes barbed wire fencing, construction of roads, observation posts, installation of flood lighting and other construction activities. Another important provision is the induction of high technology surveillance on the borders along Bangladesh and Pakistan. Rs 367 crore has been allocated for building infrastructure along the India-China border for the current financial year. In the last financial year, Rs 215 crore was allocated for the purpose. 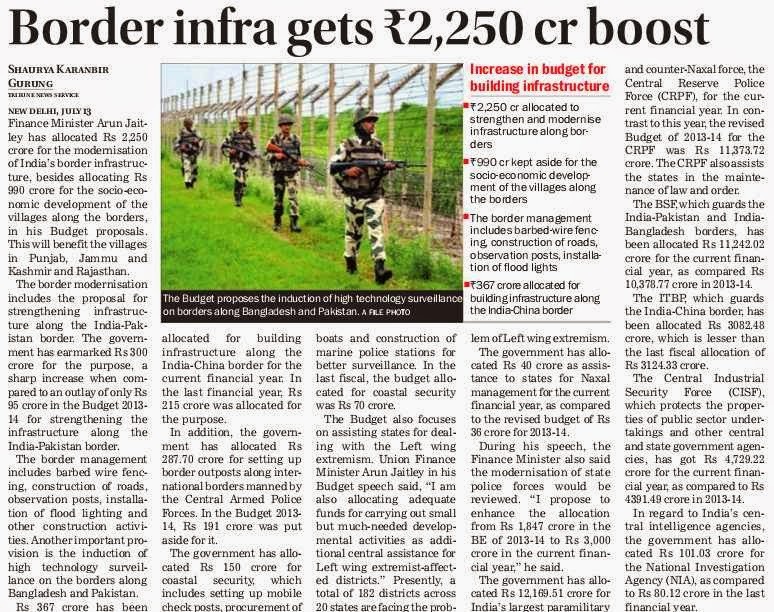 In addition, the government has allocated Rs 287.70 crore for setting up border outposts along international borders manned by the Central Armed Police Forces. In the Budget 2013-14, Rs 191 crore was put aside for it. The government has allocated Rs 150 crore for coastal security, which includes setting up mobile check posts, procurement of boats and construction of marine police stations for better surveillance. In the last fiscal, the budget allocated for coastal security was Rs 70 crore. The Budget also focuses on assisting states for dealing with the Left wing extremism. Union Finance Minister Arun Jaitley in his Budget speech said, “I am also allocating adequate funds for carrying out small but much-needed developmental activities as additional central assistance for Left wing extremist-affected districts.” Presently, a total of 182 districts across 20 states are facing the problem of Left wing extremism. The government has allocated Rs 40 crore as assistance to states for Naxal management for the current financial year, as compared to the revised budget of Rs 36 crore for 2013-14. During his speech, the Finance Minister also said the modernisation of state police forces would be reviewed. “I propose to enhance the allocation from Rs 1,847 crore in the BE of 2013-14 to Rs 3,000 crore in the current financial year,” he said. The government has allocated Rs 12,169.51 crore for India’s largest paramilitary and counter-Naxal force, the Central Reserve Police Force (CRPF), for the current financial year. In contrast to this year, the revised Budget of 2013-14 for the CRPF was Rs 11,373.72 crore. The CRPF also assists the states in the maintenance of law and order. The BSF, which guards the India-Pakistan and India-Bangladesh borders, has been allocated Rs 11,242.02 crore for the current financial year, as compared Rs 10,378.77 crore in 2013-14. The ITBP, which guards the India-China border, has been allocated Rs 3082.48 crore, which is lesser than the last fiscal allocation of Rs 3124.33 crore. The Central Industrial Security Force (CISF), which protects the properties of public sector undertakings and other central and state government agencies, has got Rs 4,729.22 crore for the current financial year, as compared to Rs 4391.49 crore in 2013-14. In regard to India’s central intelligence agencies, the government has allocated Rs 101.03 crore for the National Investigation Agency (NIA), as compared to Rs 80.12 crore in the last financial year. 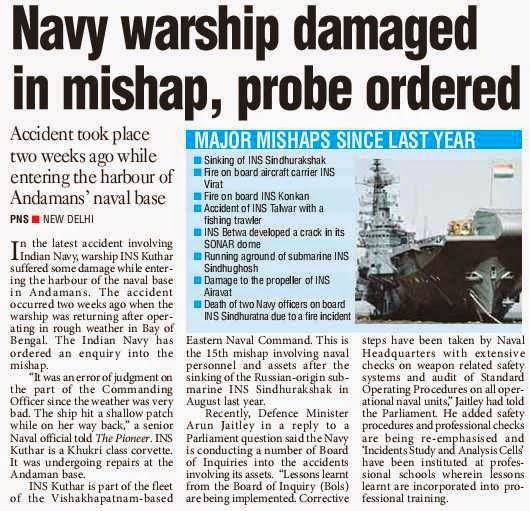 In yet another naval mishap, a warship suffered damage while operating in the Andaman and Nicobar Islands territory prompting the force to order a detailed investigation into it. 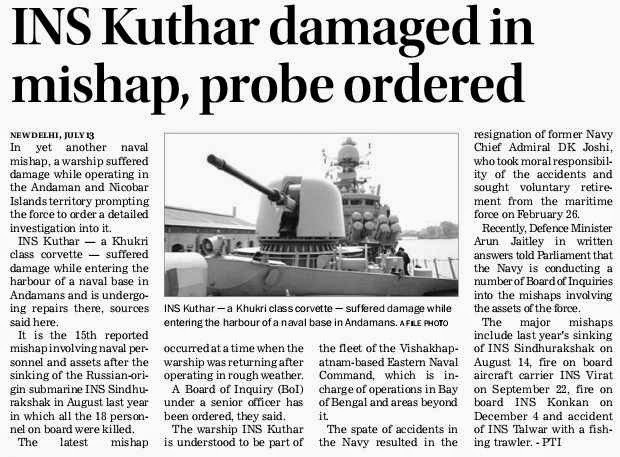 INS Kuthar — a Khukri class corvette — suffered damage while entering the harbour of a naval base in Andamans and is undergoing repairs there, sources said here. It is the 15th reported mishap involving naval personnel and assets after the sinking of the Russian-origin submarine INS Sindhurakshak in August last year in which all the 18 personnel on board were killed. The latest mishap occurred at a time when the warship was returning after operating in rough weather. A Board of Inquiry (BoI) under a senior officer has been ordered, they said. The warship INS Kuthar is understood to be part of the fleet of the Vishakhapatnam-based Eastern Naval Command, which is in-charge of operations in Bay of Bengal and areas beyond it. The spate of accidents in the Navy resulted in the resignation of former Navy Chief Admiral DK Joshi, who took moral responsibility of the accidents and sought voluntary retirement from the maritime force on February 26. Recently, Defence Minister Arun Jaitley in written answers told Parliament that the Navy is conducting a number of Board of Inquiries into the mishaps involving the assets of the force. 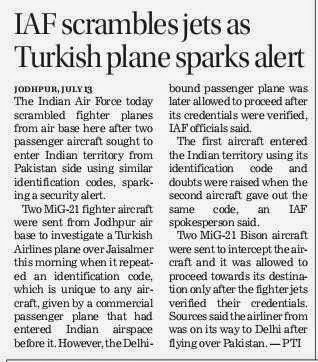 The Indian Air Force today scrambled fighter planes from air base here after two passenger aircraft sought to enter Indian territory from Pakistan side using similar identification codes, sparking a security alert. 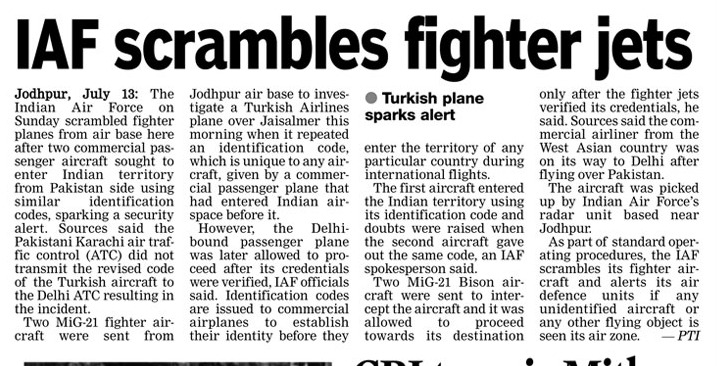 Two MiG-21 fighter aircraft were sent from Jodhpur air base to investigate a Turkish Airlines plane over Jaisalmer this morning when it repeated an identification code, which is unique to any aircraft, given by a commercial passenger plane that had entered Indian airspace before it. However, the Delhi-bound passenger plane was later allowed to proceed after its credentials were verified, IAF officials said. 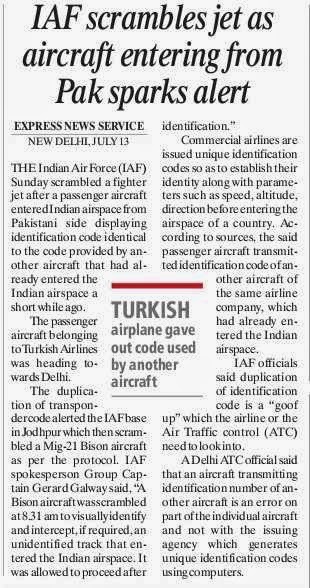 The first aircraft entered the Indian territory using its identification code and doubts were raised when the second aircraft gave out the same code, an IAF spokesperson said. Notwithstanding a 12.5% hike in defence budget taking the military spending for the year 2014-15 to Rs 2.29 lakh crore ($38 billion), India remains far below the Chinese allocation of $132 billion. The analysis after the budget was announced last week suggests that the Chinese armed forces have got 3.5 times more allocation than their Indian counterparts for the year 2014-15. The Indian armed forces got a budget of Rs 2.29 lakh crore from last years Rs 2.03 lakh crore. Of the funds allocated, the Indian forces will spend Rs 94,500 crore on procurement of weapon systems while other amount would be used to maintaining existing assets and payment of salaries. China had presented its budget in March in which raised its defence budget by 12.2% to 808.2 billion yuan (about $132 billion). In 2013, China had spent 720.197 billion yuan on national defence budget (about $117.7 billion), a 10.7% increase from 2012. The huge disparity in the budget allocation comes at a time when the two forces are building up their military capability along the over 4,000 km Line of Actual Control (LAC). The Indian armed forces are focusing on building up capabilities in northeastern states. The Army is in the process of raising an offensive formation-- 17 Mountain Strike Corps, to tackle the borders with China with its formations being set up from across Ladakh to Arunachal Pradesh. The IAF has also raised its squadrons of Su-30MKI combat aircraft in the Northeastern states and is also upgrading old airfields to enable them for fighter and other aircraft operations. New Delhi, July 12: The Indian government looks set to cancel a proposed purchase of heavy guns from the US, further delaying the army’s field artillery modernisation programme that has not taken off in 30 years. “The case for procurement of ultra-light howitzer guns through the US government has not progressed due to cost issues and because the vendor has not been able to come up with a proposal fully compliant to the offset requirements,” defence minister Arun Jaitley told Parliament in reply to a question from Asaduddin Owaisi, MP from the Majlis-e-Ittehadul Muslimeen. The government had authorised an outright purchase of 145 M777 ultra-light howitzers made by UK-US firm BAe Land Systems in January 2010. It had decided to procure the guns through the Pentagon’s foreign military sales (FMS) route after BAe’s competitor for the contract, ST Kinetics of Singapore, was blacklisted for suspected corruption in another deal. The Pentagon had notified the US Congress of the possible purchase of the M777 guns by India for around $647 million. But the contract negotiations have been stalled for nearly a year. Now, the price negotiations to contract the M777 guns are on the verge of being called off because the government is finding them too costly. Jaitley’s reference to the “offset requirements” means that the defence ministry has found BAe’s proposal to reinvest a percentage of the contracted amount in India inadequate. The ultra-light howitzers that can be under-slung from certain helicopters and lifted to troops in the mountains were meant chiefly for the army posted on the China frontier in the Northeast and Ladakh. They would be a crucial weapon for the units being raised for the 17 Mountain Strike Corps, the largest force accretion the army has planned. The army’s field artillery rationalisation plan envisaged the induction of heavy guns in three categories to replace the Bofors — 155mm/39cal ultra-light, 155mm/52cal wheeled and 155mm/52cal towed self-propelled guns. Former army chief V.K. Singh (now Union minister from the BJP) had said in January 2012 that he expected the first of the M777s to be in the country by December of that year. ikaner: Southwestern Army Commander Lt Gen Arun Kumar Sahni has conducted a two-day visit to Bikaner military station to review the operational preparedness and met with the officers. He visited various formations and establishments at the station on Thursday and Friday and was briefed regarding the ongoing operational and training activities in the division. He also witnessed training being undertaken by the formation and interacted with the Indian Army team which has been selected to participate in the International Tank Biathlon, to be held in Russia next month, according to a defence spokesperson. The Ministry of Defence will soon invite international bids for constructing the National War Memorial at Prince's Park, near India Gate in the heart of the capital, after the NDA government cleared the decks for the project. Finance Minister Arun Jaitley, while presenting the maiden budget of the Narendra Modi government yesterday, had set aside Rs. 100 crore for the memorial, a longstanding demand of the armed forces. Although a basic design and concept for the proposed memorial is available with the Indian Army, the authorities want to explore more possibilities. 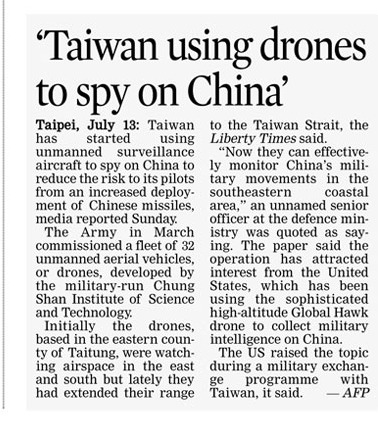 Defence ministry sources said the proposed concept includes a museum and a walkabout. Some of the images from a presentation made to Prime Minister Narendra Modi by the Army last month have been accessed by NDTV.